It's been an odd time for gaming news lately. a lot of things haven't been happening in the video game industry, but the few things that have happened are pretty hot issues. Let's take a quick look at these issues and I'll give my take on some of these. Recently, G4 reported that an attorney is planning on filing a class action suit against Sony. The suit was filed on behalf of the 77 million worldwide users of Playstation Network, and accuses Sony of gross negligence in regard to securing sensitive consumer information. This is the latest shot in the mounting backlash against both Sony and the unnamed hackers involved in the security breach. With Sony being so tight lipped early on, I wondered who was at fault. I sincerely feel bad for the gamers affected by this, but I don't feel bad for Sony, because I stand by my theory that their arrogance caused this. The votes were counted, and the next cover athlete for Madden NFL 12 will be Cleveland Browns' Running Back Peyton Hillis. Hillis won the fan voting with 66% of the vote over Philadelphia Eagles Quarterback Michael Vick. When asked about the "Madden Curse" that has affected everyone besides the former Raiders coach since Garrison Hearst was supposed to be on the cover of Madden NFL 99, Hillis said his faith would allow him to disprove such things. To me it seems like PETA got everybody they could to keep Vick from being the first two time Madden cover athlete, but somehow I don't think Vick or Eagles fans are that concerned. Finally, in what seemed to not be a big shock to those within the industry, Nintendo has announced that a new home console is in the works. It is currently codenamed "Project Cafe", and according to Mr. Iwata it will allow Nintendo to take a different approach to gaming. I'm intrigued to see Nintendo's new console, but I hope whatever Nintendo releases isn't used as a shovelware factory like some developers treated the original Wii. As of this writing, Playstation Network has been down for five days, and gamers are far from happy. Many have speculated that this shutdown is a result of an attack by a group of hackers who have attacked the Playstation servers in response to Sony's treatment of a fellow hacker. All the while, flame wars between PS3 and Xbox 360 fanboys have been popping up all over the Internet, with fans of each system going from merely discussing their system's tech to calling people all manner of insulting things. At the end of the day responsibility must be taken, and I propose that Sony take the hit for this because of their arrogance. To prove my point, let's go back to the days of the original Playstation console. Smart gamers were able to figure out that a Pro Action Replay and a spring was all they needed to play bootleg games, and it caught on big time. This primarily explains Sony's PS1 redesign which removed the expansion port. Sony took a hit, but not a huge hit. That hit wouldn't come until probably a decade later. The Playstation 2's hacking wasn't as big a problem mainly because the system didn't have built in web connectivity, but Sony's first attempt at cracking the portable market would be the one that stirred hackers to action. The Playstation Portable was touted by Sony as being highly secure, despite all of it's connectivity. Hackers discovered holes in the early firmware of the PSP and got to work, this explains the multiple redesigns and firmware updates that the PSP has experienced over it's nearly 6 year existence. It also explains why the original "1000" model of the PSP is so popular among tech savvy gamers. I personally know folks with PSPs that bootleg all of their PSP games and have multiple emulators running on it. This brings us to the Playstation 3 and Sony's arrogant claim that the system couldn't be hacked. From there, several hackers set about to make Sony's claim come back to bite them...hard. The hackers then not only found a back door into the PS3 firmware, but they then gave the world instructions to do it themselves. Sony, in response, filed lawsuits that were only succeeding in making them look like heartless monsters to the gaming public who have grown tired of increasing game prices and decreasing overall game quality. The hackers, who have apparently grown tired of this mistreatment, have proceeded to drop worm programs into major servers and Sony, not knowing what else to do, have shut down PSN until they can fix the problem. Most of this could have been easily remedied if Sony just states what anyone with computer knowledge already knows: if a piece of hardware has a place to install and store software, it can be modded. Sony's Arrogance cause this for them, when they could have just done the same thing Microsoft does yearly, and ban XBL accounts using modded hardware, if you ban them based on IP address, it remedies your problem, but what do I know, I'm just a gamer. At the end of everything, modding a system is illegal, even though you have purchased the device you are modifying. This makes little sense, but it's the way things are now. You may have to get used to outages like this one, and realize that as long as Sony continues to exhibit the arrogance they've displayed recently, this WILL happen again. Back in the early 90s, Midway gave us a gift of beautiful brutality in the form of Mortal Kombat. The game became so heralded that Congress ordered a series of hearings into violence in video games. The Mortal Kombat series spawned several sequels and spinoffs, but nothing is better than the core games in the series. The folks at Warner Bros. Interactive knew this and after acquiring the rights to Mortal Kombat from the now defunct Midway, went into action returning MK to what made it great. For starters, WB Interactive enlisted the good folks at NetherRealm Studios to bring their re-imagining of the classic fighting game to life. The first thing they did was bring the Story back to it's early 90s roots and adds a pretty solid combo system. Secondly, they updated the old characters with new costumes and animations, and gave the classic locales a great coat of polish. 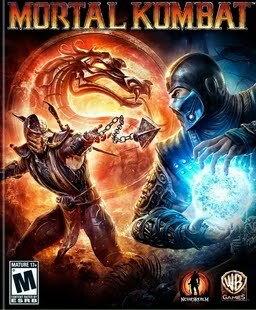 All of these things make Mortal Kombat pretty good, but what makes it more than the standard fighter is it's attention to an actual storyline and a multiplayer experience that while not perfect, makes this game more than a standard fighting game. The story mode in MK starts with the end of MK Armageddon, and Shao Khan is poised to take final victory and destroy Earthrealm. At the last second, time is set to rewind and we are taken back to the beginning of the events of the first game. From here the story mode puts players in the role of various characters in the game, and takes players from MK1 to MK3, and does so quite well. In addition to the story mode, there is also a challenge ladder that gives players an opportunity to play through several different scenarios. Completing tasks in the Challenge Ladder and story mode gives players tokens that can be redeemed in the "Krypt"where players can unlock costumes, stages, concept art, and other goodies. The single player modes are cool, but nobody plays a fighting game for that, and I'm pleased to report that the local multiplayer is a gem. At the time of this review, I hadn't had the opportunity to play online, but if the local multiplayer is any indication, the fights in this game will be as crisp and fluid as any Super Street Fighter 4 matchup. Most MK fights come in one on one and two on two tag matches. The latter can be played between two players or four. Four player fights are less frantic than one would want in the standard 2D fighter, but it is pretty good nonetheless. I will warn though, that much like other fighting games, much of the replay value is rooted in finding a good fight, so if your circle doesn't have other MK players available, you may be out of luck. As for the actual gameplay, the ultra violence that made Mortal Kombat a gaming staple almost 20 years ago is still there, but it feels less gimmicky with the inclusion of quite a capable combo system. special attacks stream between normal punches, kicks, and throws in a beautifully brutal tapestry in the hands of a capable player. That's not to say that the classic accessibility of the original MK isn't here. In fact, beginners can get into MK quite easily if they can learn one important rule: uppercuts and roundhouses are top of the food chain. Through the course of fights, a meter on the bottom of the screen build up and it can be used to perform super moves. If a player can build this meter fully, they can execute a devastating X Ray attack which deals heavy damage. Fights can be ended with the traditionally nasty Fatality moves, as well as some hilarious Babality moves. Over the course of the game, more moves can be unlocked, and the effectiveness of them can't be denied. The version of MK I was able to review was the Tournament Edition. While it lacked the figurines and bonus content included in the "Kollector's Edition", it did however, include one of the most well put together arcade stick released commercially since the Street Fighter 15th Anniversary stick released a few years ago. the controller alone is worth the price of the overall package, but I have one gripe with it. To it's credit, the arcade stick included in the Tournament Edition handles great on non MK games, but it can be awkward playing Marvel Vs. Capcom with it. This is primarily because the button layout is suited mainly for Mortal Kombat ALONE, so if you plan to use this as a do it all stick, you may be disappointed, but if you are a collector who may occasionally use it, it might be worth it for you. Mortal Kombat is not just a trip down memory lane for nostalgic gamers, but it is the best way to reintroduce and evolve a series simultaneously. Glass bottles clanging together gently accompanied by the shrill voice of a guy that kinda looks like Sean Penn. He's calling out a rival gang, The Warriors, trying to lead them to their death to keep his name clear in the murder of yet another gang leader. This scene from the 1979 movie, The Warriors is as iconic as any in modern cinema, and when Rockstar revealed that they were working on a video game adaptation of the film, which was an adaptation of Anabasis, a story by Xenophon. The Warriors recalls the quest of a handful of members of a Coney Island street gang to get back to their home turf after they're implicated in the murder of a rival gang leader, Cyrus, who was attempting to unite the assorted street gangs in New York. One of the Warriors sees the real killer, the Warriors are accused, and they make a run for it, hoping to make it back to their seaside lair. The film is set up a lot like the original story by Xenophon, but that's a story for another blog. The video game adaptation of the Warriors begins long before the events of the film, and give insight on the origins of the gang. You actually don't see the events of the movie played out in the game until the last few levels of the game, which gives players a more fleshed out experience. There's a little bit of everything for fans of action games here, from some team management (leading gang members into battle), item collection (breaking into cars and stealing stereos for money), and some serious boss fights. There's nothing overly intricate or complicated, it's just a great Beat em Up that came at a point in the video game industry that was flooded with really bad games based on movies and nothing really good in the Beat Em Up genre. The Warriors was a good game, period. It had roots in River City Ransom and Renegade, and it really showed gamers that there was still lots of life left in the Beat Em Up genre. Best part about it is that The Warriors can be found pretty cheap on Ebay. You Owe it to yourself to get a copy of The Warriors by Rockstar Games. Mortal Kombat, King Of Fighters, Street Fighter, Tekken...I've played my fair share of fighting games over the years, but they've always fallen into either very good or very bad categories. You see, Fighting games, as graphics intensive as a developer wants to make them are pretty much defined by their gameplay. A fighting game can look like crap compared to the beautifully rendered high definition affair of today, but if it plays like a dream, I'll take that ugly one any day. I figured today I would discuss a few over hyped and beautiful for their time fighting games that proved to be pretty pieces of crap. Rise of the Robots was highly touted for it's graphics, namely how the Arcade version would change the way fighting games would look. The buzz generated by the graphics quickly turned to outrage by reviewers who realized that while it was pretty, Rise of the Robots handled like a turd swimming in a tar pit. Strangely enough, a sequel was released, and it was worse (graphically and gameplay wise) than the original. King Of Fighters XII was supposed to be the current gen introduction to SNK's grand flagship fighting game series. Fans of fighting games wanted it to be as good as KOF 98, which many considered one the fighting game genre's best moments, but alas, we were left with a stripped down, no AI having mess that was so laggy over Xbox Live and PSN that it went straight to the bargain bin. It probably didn't help that much like the in the 90s, SNK was playing catch up to Capcom and it's critically acclaimed Street Fighter 4 among other heavy hitters in the fighting game genre that released between 2008-2009. Ballz: good idea, but that's where the good ends. the first attempt at a 3D fighter on consoles was choppy, controlled horribly, and the characters lacked personality. Way of the Warrior: There have been some bad Mortal Kombat ripoffs, but Way Of The Warrior has to be one of the worst. The only good thing about it is the soundtrack, which was done by White Zombie. Clayfighter: a fighting game featuring stop motion clay figures. An original idea to say the least, but horrible controls really messed with Clayfighter, which is sad, because part of my teenage self wanted to like that game. Shaq Fu: What many considered the worst fighting game ever made, even though Rise of the Robots was far worse, Shaq Fu was probably number two on the list though. Bad controls, a nonsensical story mode on a game that was touted as having a deep story, graphics that were amazingly average at best, and a cast of characters that was as unimaginative a canned biscuit. Shaq Fu was an epic turd. Like I said, Fighting games and Shoot Em Ups have the distinction of not really having a gray area. Either the game is good or bad, and no amount of gloss is going to change anyone's mind. My Wii Library, Plus My Thoughts On "Video Game Journalists"
I've gotten tired of the hate the Wii has gotten over the years, mainly because some mega publisher is afraid to make good games for it. So just in case you thought there were no good games for the Wii, I figured I'd show you guys my current Wii library, and give my two cents on so-called "gaming journalists". Over the years, a lot of really dope games came out the never saw the light of day in America. Many of which we didn't know about until the internet brought us information about these gems. Today, I'm going to take a look back at a few that would have been major hits if they were released in America. Crisis Force - Konami - Famicom: Konami dropped this gem in 1991 and it was one of the most frenetic games made for the Famicom. The fast paced gameplay, driving soundtrack, and tight controls made Crisis Force a true gem from Konami. Alien Soldier -Treasure -Mega Drive: Anyone who knows me knows that I love Treasure's work. They haven't made very many bad video games, and Alien Soldier was one of their best games. Big beautiful character sprites, highly kinetic action, a driving soundtrack, and one hell of a challenge gave me all the reason I needed to pick this one up on Virtual Console and you should do the same. Namco X Capcom -PS2 - Namco: Long before The announcement of that Street Fighter X Tekken crossover fighting games, Namco and Capcom worked together on an extremely novel idea for RPG games. Namco X Capcom was one of those games that would've been big with folks who don't even like RPGs. Maybe this crossover will make Namco consider a re release.